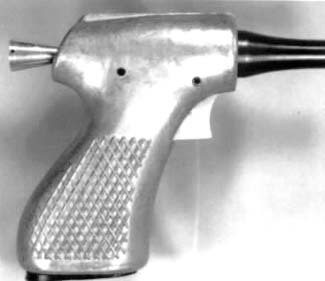 How this pistol came to be called the Deer gun is a mystery. It was manufactured in the early 1960s for the CIA. (Some Say by Winchester Repeating Arms.) The intended use was for clandestine operations in Southeast Asia. It had a CIA catalog listing as "Pistol, 9 millimeter, [FSN] 1395-H00-9108, Parabellum, single shot, 2.0 in. barrel, reloadable, c/w 3 cartridges in grip, packed for air drop." It was packed in a polystyrene box with three cartridges and an instruction sheet. It could be air dropped, and if it landed in water it would float.